As best as we can tell, the residential real estate market in the U.S. peaked in March 2018, where since that month, it has declined in 34 of 41 states for which we have recent price and sales data. 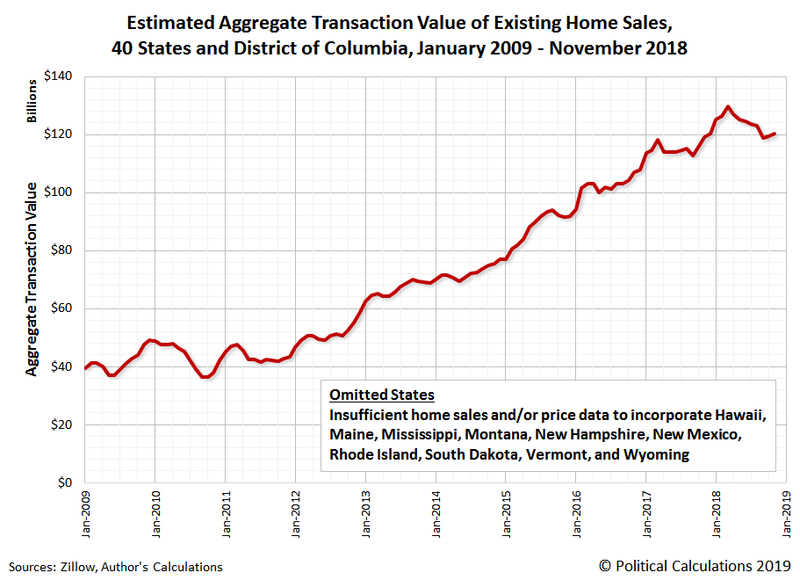 That's going by our estimate for the total aggregate value of transactions for existing home sales, which covers somewhere around 87-90% of all home sales in the U.S. economy. Using monthly sales and price data from Zillow, we estimate that this figure has fallen from $129.8 billion in March 2018 to $120.4 billion in November 2018, the last month for which estimates for 40 states and the District of Columbia are covered by Zillow's database is available. That change would mark a decline of 7% nationally. Three of these states marked a peak in March 2018, with the following declines through December 2018's initial estimates: California (-13%), Florida (-7%), and Texas (-13%). New Jersey peaked in April 2018, having since declined by 9% through November 2018, the last month for which its data was available. New York appears to have set a new peak in November 2018, following a shallow dip after having previously peaked in February 2018. 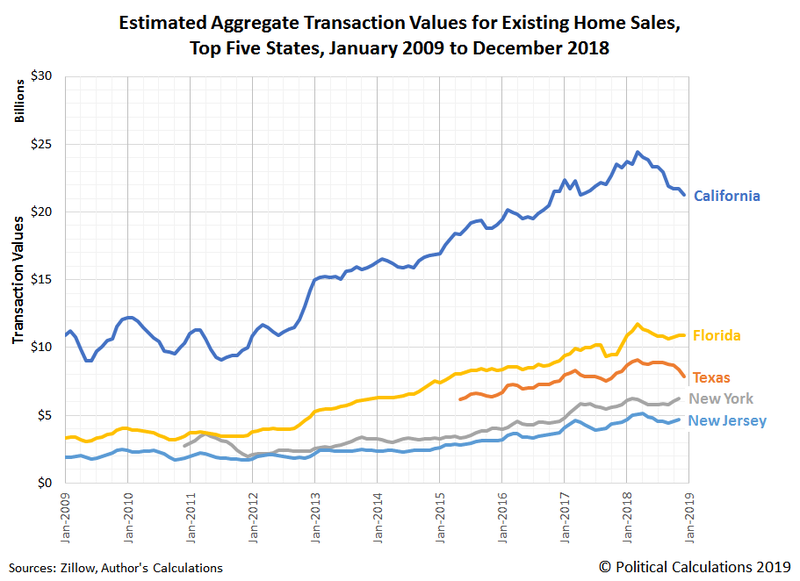 Looking closer at California, the total value of existing home transactions in that state fell from $24.4 billion in March 2018 to $21.6 billion in November 2018, accounting for nearly 30% of the national decline through those months. This large share is mainly attributable to the very large size of California's real estate market. The initial estimate for California's aggregate existing home sales for December 2018 is $21.2 billion. Getting under the hood for California's existing home sales, Zillow's seasonally adjusted data indicates that the number of sales in the state has been declining since peaking over 43,000 in January 2017, falling to 41,000 in January 2018, and down more significantly to 36,000 through the end of 2018. The seasonally adjusted median sale price of existing homes in the state over that time went from $425,000 in January 2017, up to $471,000 in January 2018, which continued to rise until peaking at $491,000 in November 2018. Compared to 2017, prices were no longer rising fast enough to cover the decline in sales that drove down the aggregate valuation of the state's real estate market in 2018.